In many fairy tales the main characters are cats and cats. To act on stage in a cardboard or foam mask is not always convenient, especially if your character has a lot of talking or singing. It is better to draw a cat face right on the face. After the performance, the mask can be washed off immediately, the benefit of modern make-up is often water-based. Choose the right picture. Cats from cartoons you are unlikely in this case will approach, they are more suitable for the production of masks. 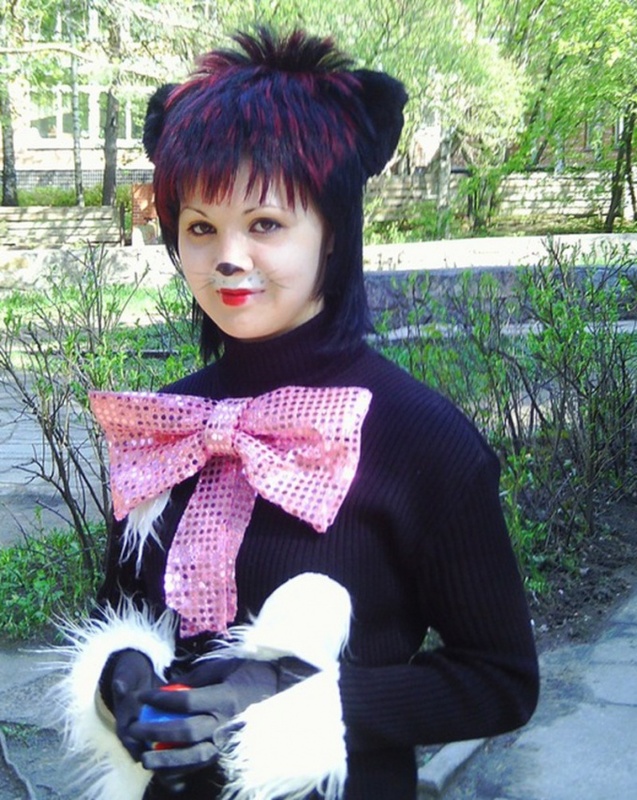 Find several options of makeup for the musical "Cats". Among the characters there is certainly a way that will work for you. If you want to create something of their own, just look for what part of the face should pay attention. Wash your face. If you use makeup, remove it and wipe the face lotion. If you are going to paint a child's face, wash your young actor. Wipe the skin dry regardless of whether you want to apply face painting or traditional theatre. In the second case, coat the face with vaseline, otherwise the makeup will be very difficult to remove. Children is paint water-based. They will not harm the skin, unlike conventional makeup, which may be too rough. Prepare make-up and what you will apply it. For face painting we need more water and the palette, which you can use a sheet of heavy white paper. For ordinary makeup, it is useful to have on hand cotton swabs or sticks. Each type of makeup its advantages. In the box theater you will find many different colors. In water colors there are only five, but they can be mixed. Manipulation of own face, of course, is best done in front of a mirror. White paint mark a place under the mustache, capturing the tip of the nose. This part of cat faces has a pear shape. Particular care should be taken to ensure that sideline turned out to be symmetrical. Easier just to paint the tip of the nose and edges of his wings, and then to brush on nosogubnye folds to the corners of the mouth and on the chin. Outlining the contours, fill the inner space with white paint. Using traditional makeup can make her look and pinkish, and greyish. Circle the eyes. This can be done exactly the same as you usually fail, only the lines must be sufficiently thick and be placed at the top and bottom. Extend the top line almost to the bridge of the nose. Then the top and bottom bring almost to his temple. Make eyebrows thicker. Make over the most convex part of the corners pointing up. Fill the interior space with black. Over the corners, draw 2-3 arc — vibrissae. They should be located symmetrically. Draw a mustache. They begin on the borders of the part you already painted white, and are diverging lines towards the ears. Moustache should also be symmetrical. Finish each line approximately in the middle of the cheeks. Cheeks put another couple of points on each side. Paint black a tip of the nose. Lips draw a regular lipstick. It is better to take dark red. Contours can be circle in red pencil to make the lips slightly wider and longer than it is, for 3-4 cm in each direction. For drawing masks fit squirrel or kolinsky brushes for watercolor painting. Uneven line adjust with a cotton swab. When using face paint needs to be wet. If the normal makeup, just erase the extra line with a cotton swab. Other options are make-up. For example, you can paint a white or grayish face. The lower part of the face is possible in this case to stroke a darker line, and then draw the same way as in the described method. If you do not have no make-up, use cosmetics. Fit pencils and lip gloss and the shade of white and light gray. The shade is preferable to liquid.